Congratulations to Amy Chapman who recently completed a 10km run in aid of Lupus UK, raising over £500.This is an amazing achievement and everyone at Chiropractic First is incredibly proud of you Amy. Well Done!! Amy is pictured here with her dad, who also completed the run. 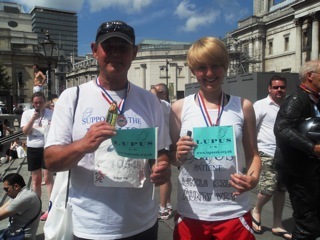 Together they have raised in the region of £2,300 for Lupus UK. George Street Artisans’ Market – it’s not just a Farmers’ Market any more! George Street in Hove becomes Gorgeous on the last Saturday of each month, when it is transformed into a festival of the best locally produced Food, Drink, Arts, Crafts, Home, Fashion, Health and Beauty products Sussex can offer. We are proud that Chiropractic First has been taking part in this excellent local event this summer and hope to see many more of you there at the next Market, on Saturday July 31st offering free spinal checks and discounted examinations at the clinic. We will also be there on Saturday 28thAugust and Saturday 25th September. Over 12,000 people came to the TakePart Festival in Preston Park this year and Chiropractic First were there in the Health and Fitness Zone. The Take Part Festival began as one of the most successful Schools Sports Partnerships in the country. Set up in 2001, and led by Dorothy Stringer Sports College,the partnership established a schools sports festival in 2006 to develop a programme for children aged 5 to 16 throughout Brighton and Hove. This event has exceeded all expectations with over 11,000 children taking part in 2007. Due to the festival’s phenomenal success and theopportunity that the London 2012 games offer in terms of public interest in sport, the Partnership, in collaboration with Brighton and Hove City Council and the local Primary Care Trust decided to expand the festival to include adults, with the intention of making a step change in participation levels for sports and physical activity in the city. Chiropractic First are proud to have also played a part in this incredible event. The aim of the Festival is simple – to use the London 2012Olympics to encourage more people to get more active more often. Of course this complements our own aim at Chiropractic First in helping all our patients improve their well-being through optimising mobility and encouraging an active, healthy lifestyle. 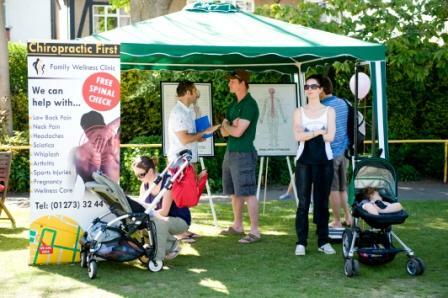 Chiropractic First has been involved in the annual Hove Lions Carnival for three years now. Mark and Lynn went down this year and despite a little drizzle, a good day was had by all. The clinic has been able to follow up with a number of people who came to see us at the Posture Check stall and we look forward to forming long and rewarding relationships with all our new patients. This was a lovely, sunny family day out. Every year St Anne’s Wells Gardens on Somerville Road in Hove holds its Spring Festival which involves live music, children’s activities local stall holders and lots and lots of food! This year’sattractions included a viewing tent where you could watch some of the earliest film ever produced in the studios that used to be situated in the Gardens, a climbing wall, a boxing and kick-boxing ring, the opportunity to meet a number of children’s TV characters and of course to buy organic, locally grown farm produce and herbs. There was a tranquil area in the Scented Garden where local masseurs were offering visitors a relaxing massage amidst the excitement. This was where the Chiropractic First Spinal Screening was situated. We always appreciate the opportunity to meet new people and help them understand how chiropractic may be able to help them with their level of well-being. 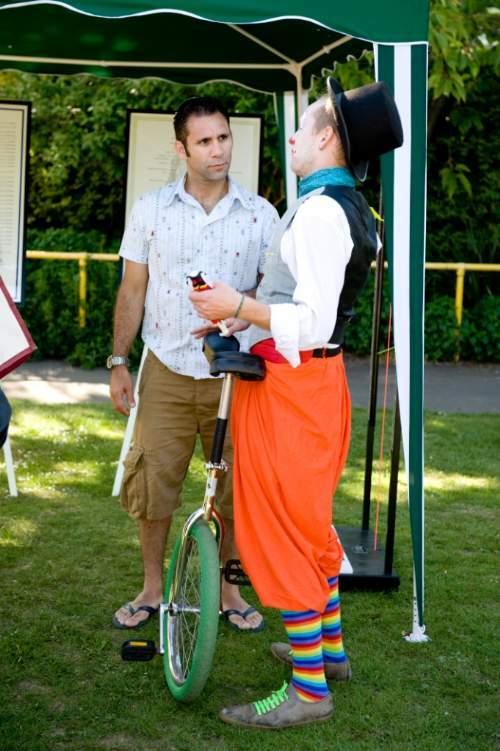 However, it’s not everyday you get the chance to give advice to a unicycling clown! It was a great day out and we look forward to taking part in next year’s festival.